Originally a model 210 Economy but I have fitted a 225 engine and removed the pedals and done various other changes. You can see that I have removed the rear of the frame, mudguards, plastic side trims and replaced all the electrics. It now has a Dellorto carburettor and a slightly freer flowing exhaust which has enabled me to fit a 14 tooth gearbox sprocket in place of the normal 13 tooth. This all makes it run very well, with slightly better acceleration and top speed. This bike is now my preferred means of transport, both for local trips and for longer journeys. The same questions seem to be asked over and over again in the e-mails that I receive so I thought it would be useful to list a small selection of the most regular ones. Usually the answer, or at least the best information that I can give, is already available somewhere on the site. By the way, thanks for all the kind comments about the site that I also receive in e-mails from fellow moped enthusiasts. Q: Where can I buy spares for my Babetta? Q: My moped won't start / won't run / dies after a few minutes. Why? A: Jawa mopeds are very simple devices but, like all machines, you need to follow a logical sequence of checks to find a fault. Most of the handbooks & manuals available from my "manuals" page, have quite comprehensive fault finding guides which guide you through possible solutions to common problems. The electronic ignition units have a bit of a reputation (largely unfounded) for being unreliable, but in my experience, 99 times in 100 the problem is fuel related. I have put together a data sheet Electrics - Ignition which contains all you ever wanted to know about the Babetta ignition systems. If you need further help, there is a useful fault finding guide on the Moped Riders Association web site, “moped repair” section. Follow the link and read the excellent “Fred’s Guide” or for even more detailed information, look at “Dempsey Moped Repair” book on the same site. Q: I need a new electronic ignition unit. A: The red Transimo unit from the Model 28 & earlier model 207s is unobtainable now. Both the 4 pin thyristor unit used on later 207s and earlier 210s and the 3 pin version with the built in coil used on later model 225s is still available from www.MZ-B.com and other suppliers. Download my data sheet Electrics - Ignition which contains lots of information about the ignition systems including how to update your moped to later and better versions of the electronic units. Q: What grade spark plugs should I use? A: All the Babetta literature suggest the same heat range plugs, ie; Brisk N17 or Champion L86 but depending on your local climate, it might be worth trying a hotter or colder plug. Early literature for the model 05 and 20 give PAL 14-7RZ but later books for the models 05, 20, 21 & 23 all give PAL 14-8R. Brisk’s application tables recommend N15C for all these models, equivalent to Champion L82. The Pionyr literature gives PAL 14-175, I can’t find an exact equivalent for this but a Brisk N15C as on the models 05-20-21-23 is probably right for these as well. See my equivalents table for other brands. In all cases the plug gap should be set to 0.5mm (0.020”) maximum. On older models with old generators, it might be worth trying reducing the plug gap to 0.4mm (0.016”). Don’t be tempted to use any larger plug gap as this will put excess load on the ignition system components. Q: What ratio of oil to petrol should I use in my moped? A: There is always a big argument amongst two stroke owners about this. Not enough oil and there is a serious risk of bearing & piston damage or seizure, too much oil and the engine will be running weak and it will be difficult to start and liable to plug fouling. Some people use the much more expensive fully synthetic oil but others, myself included, stick with normal mineral oil. Remember that our mopeds were designed to run on whatever oil and petrol that could be obtained in the former Eastern Bloc countries. The model 05 handbook says 1:24, the models 20-21-23 handbooks say 1:24 or 1:30, the models 207 and 28 handbooks say 1:30. The model 210 workshop manual says 1:33 but the 210 handbook says 1:50. A proper, good quality 2 stroke oil should be used. I always use Castrol 2T at about 1:33 mix in my Babettas and slightly more oil in my model 20 scooter and Mustang. Some ratios quoted are for multi-grade engine oil but this should only be used in emergencies and at a stronger mix (more oil). It is always recommended to use more oil (say 1:25) during the running-in period. More oil is recommended in the literature for the older models, such as 1:25 (1:16 for running in) for the Jawetta and 1:24 for the model 555 Pionyr. I would stick to these recommendations. 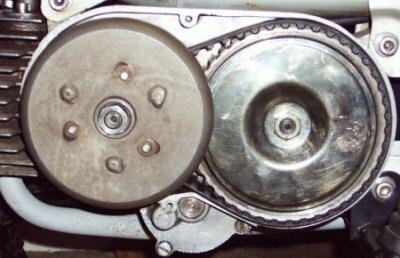 Q: What oil should I use in my moped gearbox? A: Some handbooks say that there is no need for oil in some single speed gearboxes. Whilst it is true that there are no actual gears there are still shafts running in bearings and seals which need lubrication and the single speed 207 models have a gear primary drive, which needs to run in oil. Most mopeds have oil filling, level and drain holes and plugs - see the handbook appropriate for your model for the positions of these. You should always put oil in these Jawa moped gearboxes up to the level plug hole - do not overfill. Some 1990’s single speed 210 models had no fill, level or drain plug holes for gearbox oil. These may have pre-greased bearings and the bearings could be sealed, then they can run without gearbox oil. Best choice of oil to use is a good quality EP 80W-90 gear oil of no more than GL-4 spec (do not use GL-5). Or use a synthetic or semi-synthetic multigrade engine oil in a grade of 20W-40 or 15W-40 and change it more frequently. See my Gearbox Oil data sheet for more information. 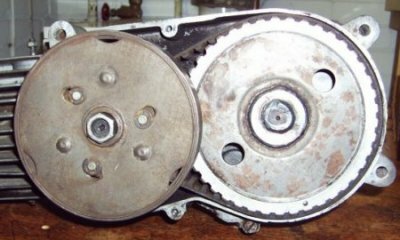 Q: I have a 2 speed moped but I can’t tell if the gear change is working properly? A: If you're not used to it, the Jawa automatic gear change seems a little weird. From a standing start, you open the throttle fully and off you go in low gear. As speed builds up, as long as the moped is not badly overloaded or climbing a hill, it should automatically change up to high gear between about 15 and 18mph. There isn't a sudden change in revs or speed, it is just a gradual reduction in engine revs but the moped continues accelerating. The 2 speed mopeds don’t have a top speed any faster than the single speed, they just pull away quicker and handle hills better. There is a very comprehensive checking procedure for the gear change function in the model 210 workshop manual from my Manuals page. 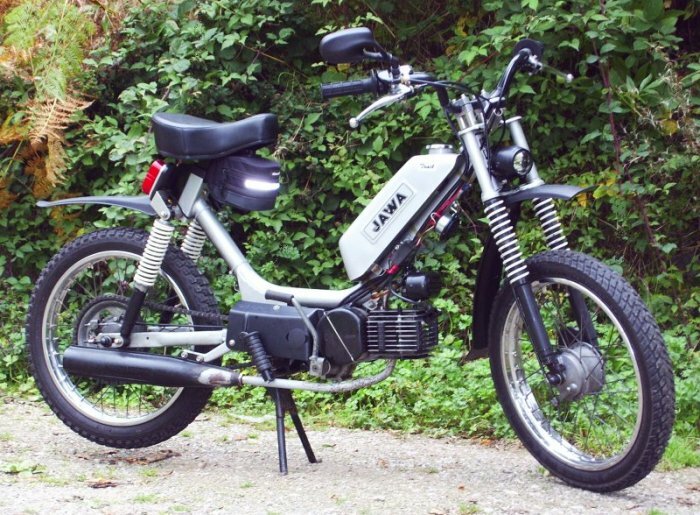 Q: I want to buy a Jawa 210, is there a way to tell if it is a single speed or a two speed model without being able to ride it? A: If it's got a kick-start lever and no pedals then it's a two speed. If it's got pedals it could be either. Remove the left hand crankcase cover - its an oval, black plastic cover held on with two screws. Looking at the primary drive, compare the large, rear most, toothed, driven drum with the two pictures here - the single speed (top picture) has a solid drive drum with a welded centre, the two speed (lower picture) has a thin pressed cover plate over the centre of the drum, held with a nut in the centre. The nut and plate are there give access to the second speed drive clutch. The pictures show two different versions of the starting & drive clutch drum which is the other drum, nearest the front of the engine, this is just an older and newer version of the same part. Q: What is my moped worth? A: The short answer is - whatever anyone is prepared to pay for it. Further than this I can only speak for UK prices. Babettas, models 207 and. more usually, model 210 / 225s come up on ebay quite regularly and seem to sell for £100 to £200. A well looked after but used moped is probably a safer bet than one of the very low milage model 210/225s that still come up for sale, these have probably been used for number plate retention and may be of dubious quality. A running and better still, tested, later moped like a Stella, Betka, Dandy or Manet will be worth a bit more as only a few of each were sold over here, though spares will be a problem and a non-runner will only make sense if you are able to do any necessary work on it yourself. Older models like the Pionyr, model 20 or Mustang are also more rare over here and worth a bit more but seem to be available and not too expensive in the Czech & Slovak Republics - look on Bazos.sk Look at my Spares & prices data sheet for a bit more information. Q: We have just bought a Jawa moped and are trying to figure out what year it is. A: There should be a VIN plate on the steering head, behind the headlamp, this should give a year of manufacture. It might just say 196_ or 197_ or 198_ they sometimes didn't stamp the last number of the year, or sometimes even the last two. Otherwise just compare it to pictures on the site to find out which model it is and the notes on my “manuals” page will give an earliest and latest year of manufacture. * rest is a running number. Sometimes, especially in Europe you get only the end 6 digits. I think that for US-exports they always used the ISO 17 digit number. Thanks to MZ-B for this VIN information.